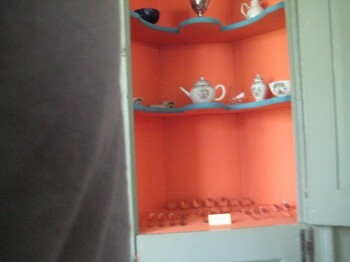 At the time of my visit, Glebe House (it’s just Glebe House like Eurythmics) was a no photos museum. Therefore, my photos are horrible and nonsensical because they were all furtive. 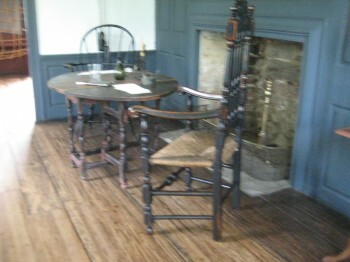 But the story here is not the bones or furniture of the house, but rather the actions that took place in it 240 years ago. Here in Woodbury, right around the corner from Rob Zombie’s house, another wacky ET Progressive road sign and the incomparable Dottie’s Diner, there sit two old houses that are now museums: The Hurd House operated by the town’s historical society and the Glebe House operated by something called The Seabury Society for the Preservation of the Glebe House. (Yes friends, we’ve much to learn on this page.) I used to cite this situation, as you can literally throw a rock from the Glebe through a window at the Hurd, as yet another bit of provincial Connecticutness. One was open when the other was not and vice versa. But as I write this page, I see that while the Glebe is open way more than the Hurd, if you find yourself in Woodbury on a Sunday during June through October between 2 and 4 PM, you can actually visit both at the same time. Huzzah. I first enjoyed the garden. 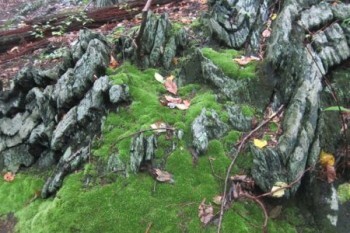 This is not just any old garden, no, this is a Connecticut Historical Garden! It’s not huge, but it is very nice. You can read more about the garden here. In short, from the Glebe House website: In 1926, the famed English horticultural designer and writer Gertrude Jekyll (pronounced jeek uhl) was commissioned to plan an “old fashioned” garden to enhance the newly created museum. Jekyll had a profound influence on modern garden design and is widely considered the greatest gardener of the 20th century. 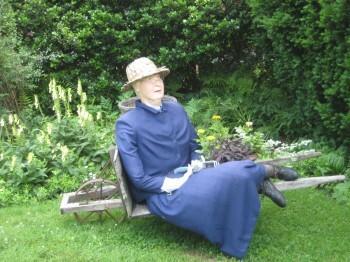 After the garden, I went inside where two women dressed in period garb greeted me and asked if I wanted a tour. Of course I did, but let’s speed it up a bit, can we? I know I don’t really look like a veteran of historic house museums, but I am actually quite a veteran of historic house museums. Skip all the cliché stuff please, thanks. But here’s the thing about the Glebe: there actually isn’t too much cliché stuff. First and foremost, it’s called the Glebe House and Glebe isn’t a person’s name, it’s a thing. A fairly interesting thing with historic import. No, it’s not the fact that the 1750 house is an unusual combination of gambrel and saltbox roof styes… it’s a religious thing. An Episcopalian thing. I am. Back in the day, the English Christians weren’t hip to the whole Popey thing so they split and formed the Anglican Church. All sorts of offshoots followed, of course, because the infallible word of god is, strangely, quite open to interpretation. Anyway, the US was about to go through it’s revolution and the Anglican doctrine had some stuff it basically praying to the English royalty. The Episcopals were the Anglicans in America. And Scotland. And other random places around the world Taiwan and Colombia and Haiti, but whatever. This wasn’t much of an issue pre-Revolution. In 1771 Woodbury’s first Episcopal priest, John Rutgers Marshall of New York City, arrived with his wife Sarah. By the end of the Revolutionary War, John Marshall and his family had endured the oppression suffered by many New England Anglicans who were often presumed to be loyal to the king, whether or not they were in fact. Oh yeah, the name. A glebe is an area of land within an ecclesiastical parish used to support a parish priest. The plural of it is apparently also glebe. 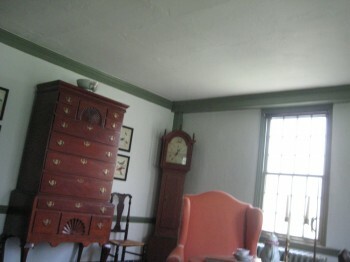 This house was built around 1750 and was the rectory for St. Paul’s Church in town. This whole glebe thing started back in Medieval times and… Put it this way: ¬ an Anglican priest lived here in Colonial times and the house and land was a glebe back then. 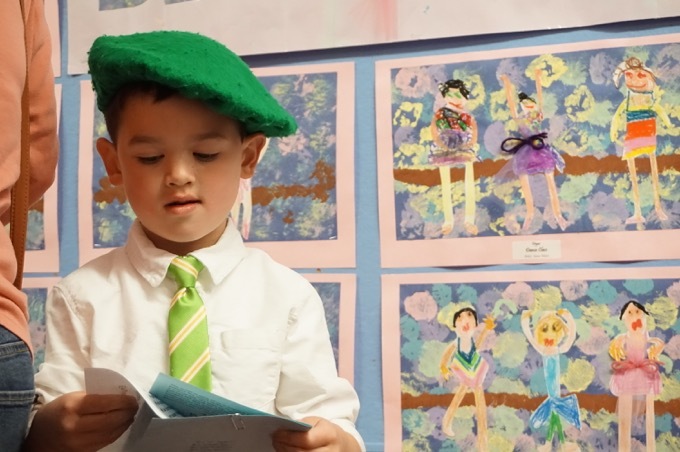 With the American revolution, our fair Episcopalians, a word I’m tired of typing, had a problem. They couldn’t do whatever Episcopalians do to become “official” anymore because it involved loyalty to the crown. Uh-oh. So only weeks after our independence was secure, a group of Episcopalians met secretly here, at the Glebe House, to make a momentous decision; to take part in the building of a new nation while upholding their religious heritage. Although it doesn’t sound all that important today, this was a really, really big deal. The group elected the Reverend Dr. Samuel Seabury as the first Bishop in the new world, a decision that assumed both the separation of church and state and religious tolerance in the new nation. Right here! 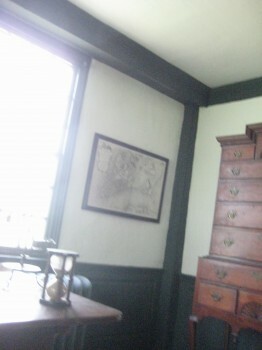 In the Glebe House in Woodbury, Connecticut! Here’s how it all went down. So, remember the Rev. John Rutgers Marshall guy I mentioned earlier? 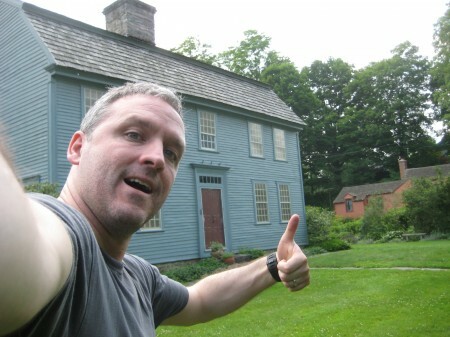 He lived in Glebe House from 1771 until 1785, through the whole American revolution thing. On Mar. 25, 1783, ten clergy met there and selected Samuel Seabury and Jeremiah Leaming as candidates for Bishop of Connecticut. Seabury accepted the election and sailed for England to be consecrated. He arrived in England on July 7, 1783, and spent over a year trying to get consecrated by English bishops. Come on, Seabury, what were you thinking dude? For a number of reasons, including the need to take the oath of allegiance to the King of England, no bishops would consecrate Seabury. So he did what any self-respecting patriotic Episcopal aspiring bishop would do: He went to Scotland, where he was consecrated at Aberdeen on Nov. 14, 1784, at the chapel in the home of John Skinner, Bishop Coadjutor of Aberdeen. This is why you see a Cross of St. Andrew on the Episcopal Church flag. We all need a good Coadjutor in our lives. So who, you ask, was the actual consecrator? The consecrator was Robert Kilgour, Bishop of Aberdeen and Primus of the Nonjuring Episcopal Church in Scotland. Duh! Do you think that guy flaunted his Primus of the Nonjuring Episcopal Church in Scotland title around? You know he did. Anyway, on Aug. 3, 1785, the clergy of the Connecticut convocation elected Seabury their bishop. I have no idea why there was such a delay from his consecration in Scotland to his consecration convocation in Connecticut, but I guess these things take time. The consecration of Samuel Seabury and the bringing of the historic episcopate to the Episcopal Church is commemorated on Nov. 14 in the Episcopal calendar of the church year. This painting is Seabury getting, ahem, consecrated. Or something. I got it from this page about Seabury. 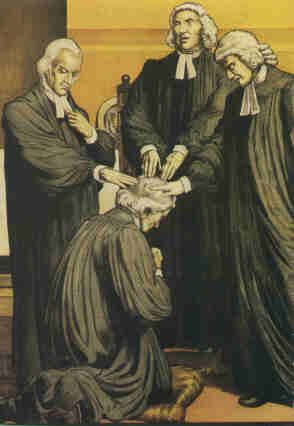 Eternal God, who didst bless thy servant Samuel Seabury with the gift of perseverance to renew the Anglican inheritance in North America; Grant that, joined together in unity with our bishops and nourished by thy holy Sacraments, we may proclaim the Gospel of redemption with apostolic zeal; through Jesus Christ, who liveth and reigneth with thee and the Holy Spirit, one God, for ever and ever. Amen. 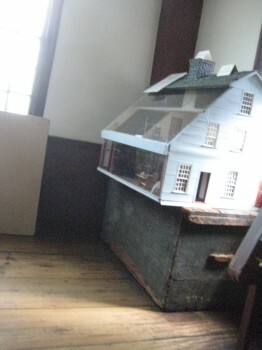 After the Marshalls had moved from the Glebe House, Gideon B. Botsford, a silversmith, lived in the house. 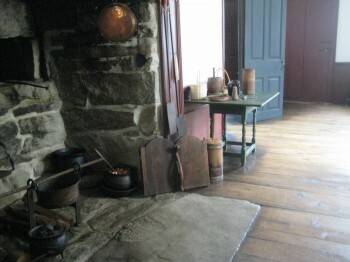 Botsford lived and worked at the Glebe House with his wife and family of eight children through the mid-19th century. 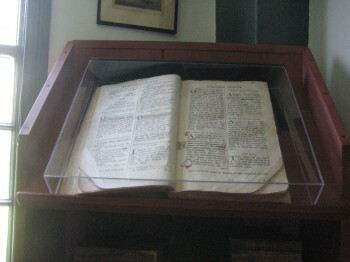 In 1892 three Connecticut clergy bought it for $500 as a gift for their bishop, John Williams. In 1923 Edward C. Acheson, Bishop Coadjutor of Connecticut, formed the Seabury Society for the Preservation of Glebe House. And that, my friends is how this place became the Glebe House Museum run by the Seabury Society for the Preservation of Glebe House. 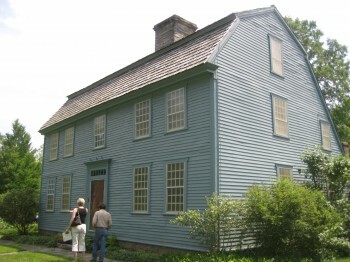 As plans were discussed to tear down the house, it was saved by the Seabury Society for the Preservation of the Glebe House, which repaired the building, began collecting furniture, and raised funds to ensure continued operations as a museum. The Glebe House was restored in 1923 under the direction of William Henry Kent, pioneer of early American decorative arts and the Metropolitan Museum of Art, New York. 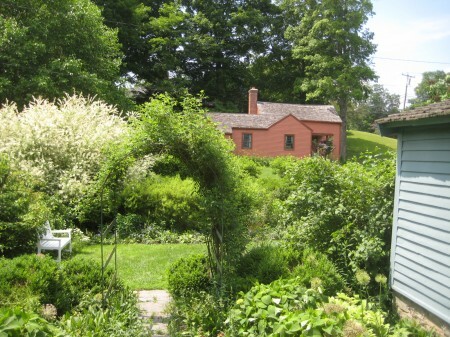 One of the early historic house museums in the country, The Glebe House opened its doors to the public in 1925. There’s a bunch of old furniture and fine china and fireplaces and wide floor boards and many-paned windows and, yes, even the “sleep tight” bed thing. My tour guide was excellent and knowledgeable and did a good job parsing fact from legend – something I really appreciate. A tour of the Glebe House museum is cool because you learn about the PEOPLE that lived and visited here, not just about the old kitchen implements.